A photograph of Kathleen Murphy advertised the beginning of the Film Company of Ireland’s 1917 production season; Evening Telegraph 7 Apr. 1917: 4. In April 1917, the Film Company of Ireland (FCOI) began publicizing the fact that they were beginning a second season of production. On 7 April, a photograph of Kathleen Murphy appeared in the Evening Telegraph‘s “Music and the Drama” column, with a caption indicating that she was playing the part of Nora Lahy in a film adaptation of Charles Kickham’s Knocknagow that was already in production. Based on Ireland’s most popular novel of the late-19th century, Knocknagow on film would be an ambitious undertaking, and it would be popular with contemporary Irish audiences. And because it – along with Willy Reilly and His Colleen Bawn (1920), is one of only two FCOI films that survive in a substantially complete form, it is relatively well known, at least by film scholars (see here, for example). However, the film of Knocknagow would not reach Irish audiences until early 1918. Irish Independent 10 Nov. 1917: 2. FCOI made two other feature films during the summer production season of 1917: the comedy Rafferty’s Rise and historical romance When Love Came to Gavin Burke. However, despite the fact that the May 1917 issue of Irish Limelight published photographs from Rafferty’s Rise, the release of these films would also take many months. As a result, the FCOI’s 1916 films continued to circulate and represent – indeed, to constitute – the company’s released output for much of 1917. Nevertheless, beyond O’Neil of the Glen and perhaps The Miser’s Gift – both of which have already been written about here – very little is known about the other 1916 films. This is not surprising because surviving information on them is scant. In marked contrast to the barrage of publicity that heralded the release of O’Neil of the Glen and, to a lesser extent, The Miser’s Gift, the later 1916 films seem to have appeared with little fanfare. Nevertheless, bringing together some of surviving information reveals hitherto unknown aspects of these obscure but important early Irish films and the company that made them. FCOI advertised upcoming releases in the Irish press on 14-15 August 1916. This one appeared in the Irish Times 14 Aug. 1916: 4. Even the number of films they made in 1917 is not entirely clear. 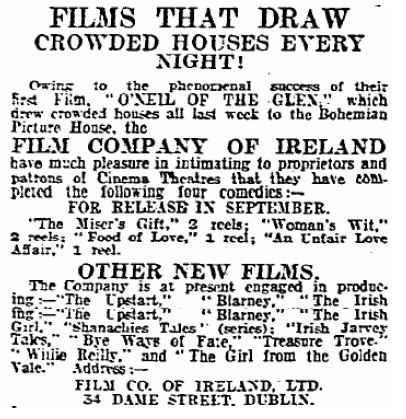 With O’Neil of the Glen newly released and creating a stir in August 1916, the company announced in the Irish dailies that it had a further four films ready for release in September: The Miser’s Gift, Woman’s Wit, Food of Love and An Unfair Love Affair. 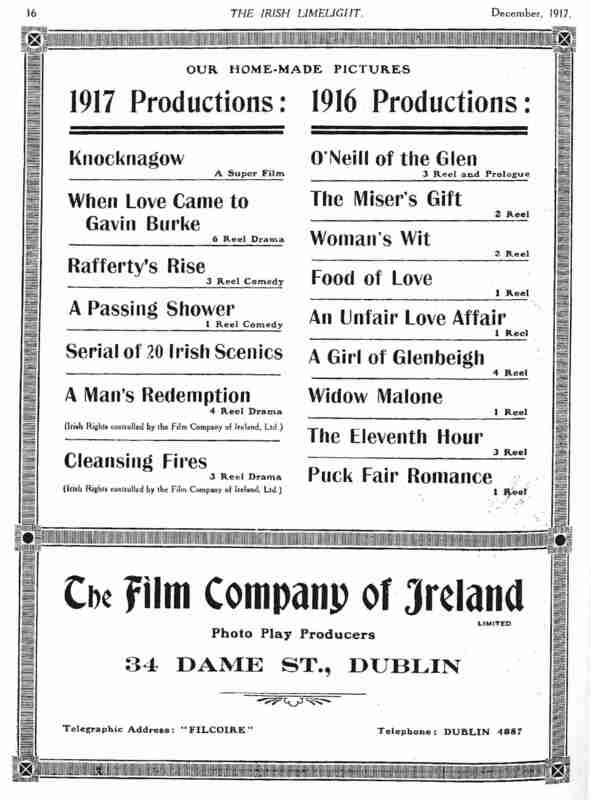 As well as these presumably complete or almost complete films, it listed nine other titles that it had in production: The Upstart, Blarney, The Irish Girl, a series called Shanachies Tales, Irish Jarvey Tales – possibly another series – Bye Ways of Fate, Treasure Trove, Willie Reilly and The Girl from the Golden Vale. With so little surviving information, ads such as this have often been taken as confirming that these films were actually made. These films appear in the standard Irish and British filmographies – Kevin Rockett’s Irish Filmography and its online version, and Denis Gifford’s The British Film Catalogue, as they do in the books that take these reference works as a source. Trade journals and local and national newspapers fill in some – but by no means all – of the details of FCOI’s filmmaking and exhibition exploits from the summer of 1916 to the summer of 1917. These sources show that all four films from the first group were subsequently released, albeit not in September 1917. Of the second group, only Willie Reilly is readily recognizable as an FCOI title – Willy Reilly and His Colleen Bawn – but it would not be released until April 1920. Some of the other eight films named in this ad may be working titles for the films that FCOI did release in late 1916 and early 1917. There is substantial evidence that in addition to the five films already named, the company released four others in this period: Puck Fair Romance, A Girl of Glenbeigh, The Eleventh Hour and Widow Malone. Ad for FCOI films released in 1916 and made in 1917. Irish Limelight Dec. 1917: 16. None of these corresponds exactly to the in-production titles mentioned in the ad, but some are close, such as the in-production titles The Girl from the Golden Vale and The Irish Girl which bear a similarity to A Girl of Glenbeigh. These were, of course, Irish versions of titles in the format “An X Girl” or “The Girl of X” that had been internationally popular for decades. However, as A Girl of Glenbeigh specifically names a place in Kerry, it is unlikely to have morphed from The Girl from the Golden Vale – with its reference to the rich farmland in the counties to the east of Kerry. But the film may have begun life under the less specific title The Irish Girl. That said, the in-production titles that include Irish place names suggest a different geography from the four that were finally made. Blarney and The Girl from the Golden Vale indicate a company working in Cork, while A Girl of Glenbeigh and Puck Fair Romance are firmly located in west Kerry. The issue of the films’ geography deserves further discussion, but this blog will work on the basis that FCOI did not make all the films named in the 14-15 August ad. Evidence suggests that the company released not fourteen films but nine in its opening season, which nonetheless represents a substantial output. For clarity, those nine films are: O’Neil of the Glen, The Miser’s Gift, Woman’s Wit, Food of Love, An Unfair Love Affair, Puck Fair Romance, A Girl of Glenbeigh, The Eleventh Hour and Widow Malone. Although this blog will have something to say about the first two, it will mainly focus on the latter seven. J. M. Kerrigan, Irish Limelight January 1917: 3. All nine of these films appear to have been directed – the contemporary term, confusingly, was “produced” – by Abbey Theatre actor J. M. Kerrigan, who also starred or at least had a prominent acting role in many of them. Kerrigan was one of FCOI co-founder and producer James Mark Sullivan’s earliest recruits to the company; he was already working with FCOI in March 1916 – the same month as Sullivan and his partner Henry Fitzgibbon registered the company – and may even have invested money in it (Holloway, 21 Mar.). Kerrigan was soon joined by other actors from the Abbey and other theatres, most frequently by Fred O’Donovan, Kathleen Murphy and Nora Clancy, and more occasionally by Brian Magowan, J. M. Carre, Irene Murphy, Valentine Roberts and others. Also a star of the Abbey, O’Donovan would take over as FCOI’s actor-director for the 1917 production season when Kerrigan left Ireland for the United States in early 1917 on a career path that would eventually see him become a well-loved Hollywood character actor. His permanent departure seems to have come as a surprise to some in the press. On 12 April, Paddy reported that Kerrigan “has left America on his return voyage, and is expected to arrive almost any day now.” A report a week later suggested that he had little thoughts of returning to Ireland. “He has ‘made good’ out there in a surprisingly short space of time,” J.A.P. (Joseph A. Power) noted in the Evening Telegraph on 20 April, referring to reviews of Kerrigan’s early US stage performances. “It is only a few months since he left Ireland, yet here are the blasé Yankee journalists hurling bouquets at him with all the vigour of the great American language” (“Gossip of the Day”). Engaging prominent Abbey actors bolstered FCOI’s claim that it was the Film Company of Ireland and was extending into the new cinematic medium the Abbey’s project of representing Ireland differently. “With the assistance of such artists as they had associated with them,” Fitzgibbon was reported as saying at a press luncheon in June 1916 to celebrate the launch of O’Neil of the Glen, “with Irish scenery and Irish literary talent, they were bound to succeed and be proud of the enterprise in which they were engaged” (“New Irish Industry”). If anybody was well placed to revise the representation of Irish people through performance, it was Kerrigan and this group of Irish actors who were intimately familiar not only with the plays and acting styles of the Irish revival developed at the Abbey but also with the modern drama represented by Shaw and Ibsen. But the company was also open to performers from beyond Ireland: “In the next film,” the Irish Times reported, “Mrs. H. M. Fitzgibbon, a vivacious French lady will make her appearance” (“Irish Film Production”). Although FCOI publicity made much of the claim that their films were “all Irish,” Fitzgibbon’s wife Peggy Darval was mentioned among the cast on occasion (“Back from Kerry”). This remark about his marriage to an actress also suggests that Fitzgibbon, about whom little else is known, may have had a personal motivation for getting involved in the film business. FCOI seeks scriptwriters: Irish Independent 28 Mar. 1916: 1. But actors alone were not enough for the company’s success. When Fitzgibbon mentioned the “Irish literary talent,” he must have been referring in part to Bernard Duffy, the writer of several one-act rural comedies for the Abbey who had also attended O’Neil of the Glen’s launch. Duffy praised FCOI for its “wholesome desire to reproduce the atmosphere of the country, and the motive was not purely mercenary. A vast field of folk literature was yet to be explored and utilised” (“Irish Film Production”). Nevertheless, sourcing new or adapted stories seems to have been difficult, and few if any Abbey playwrights were involved in the company. FCOI advertised more frequently in the press in 1916 for scenario writers than for other kinds of collaborators. Following the destruction of its offices in Henry Street during the Rising, FCOI moved to Dame Street. Dublin Evening Mail 12 May 1916: 7. Discussion of the company often mentions the destruction during the Rising of FCOI’s offices at 16 Henry Street but less frequently reveals the names of the people who worked there or in their new offices at 34 Dame Street. All the 1916 films were shot by John A. Bennett, who had worked for many years as the chief projectionist – or “operator” – and sometimes cameraperson for James T. Jameson’s Irish Animated Film Company based mainly at Dublin’s Rotunda, as well as later acting as the Dublin manager for the distribution company Films, Limited (Paddy, 18 Nov.; 13 Jul.). However, by January 1917, Bennett was seeking other work, presumably because he was not being paid by FCOI (Paddy, 11 Jan.). In any case, FCOI’s camera work in 1917 was first taken up by the company’s secretary Robert Justice – he featured in a June 1917 Irish Limelight article in this role – before Pathé camera operator William Moser became the company’s cinematographer (“With the Film Co. of Ireland”). Joseph Boland Irish Limelight Jun. 1917: 6. Among the other identifiable members of the company in 1916 and early 1917 were the sales and marketing operatives Mr. Coen, Joseph Boland and Ben Cowan. These men were vital to FCOI’s success, and although usually ignored by later film historians, they received considerable attention from contemporary trade journals because these were the people that journalists and cinema managers were most likely to meet. Coen was the company’s sales agent in Ireland until September 1916 when he was replaced by Boland, who for some years had been the travelling representative for General Film Supply (GFS), Ireland’s other major film production company of the period (Paddy, 28 Sep.). Boland appears to have had a good reputation in the industry in Ireland; the distributor M.P. Sales tried unsuccessfully and publicly to lure him away from GFS in early 1916 (Paddy, 17 Feb., 24 Feb., “Bioscope Parliament”). 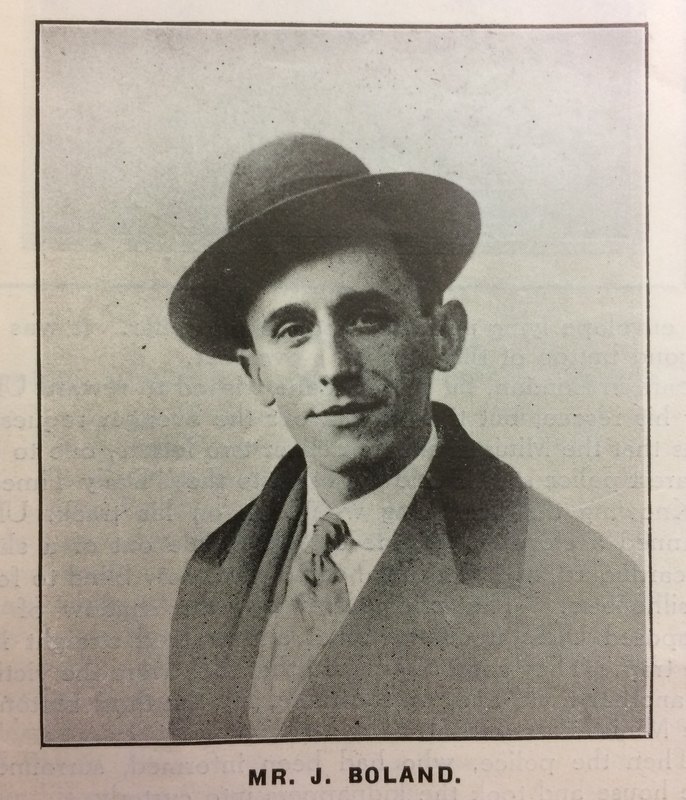 Cowan – one of a number of Russian Jews working in the early Irish film industry – ran Express Film Agency, the Irish agent for several British distributors, and he acted as publicist for the very successful 7 August launch of O’Neil of the Glen. Following this, he told reporters that “he intends to introduce many novel ideas in the advertising line. Another Trade show will shortly be held, at which it is Mr. Cowan’s intention to screen two more subjects” (Paddy, 27 Jul.). In the event, the second trade show on 17 August 1916 at the Dame Street Picture House would feature just The Miser’s Gift. FCOI was intensely busy in August 1916. In Dublin, Cowan was publicizing the five complete or nearly complete productions shot earlier in the summer, as well as the other eight titles notionally in production. The Miser’s Gift was trade shown three days later. At some point in early August, Sullivan and Kerrigan brought the cast and crew to Kerry to shoot the four fiction films that would actually make up the second half of their 1916 production season. The date of departure is not clear, but if Puck Fair Romance was actually shot at Killorglin’s Puck Fair in 1916, then the company would have to have been in Kerry before 12 August because the fair took place between 10 and 12 August. They were certainly in Kerry by 20 August. An article in the Kerry News reported on a fundraising concert that FCOI mounted on 3 September to clear the debt from Glenbeigh’s Catholic church. It observed that the company “came to Glenbeigh two weeks ago where they opened a tour of the Kingdom’s beauty spots, and at present they are staying at O’Sullivan’s hotel, Muckross, having the scenes in several new films laid in and around Killarney” (“Film Company of Ireland”). If “two weeks” here is to be taken literally, the company reached Kerry on or about 20 August, but this seems like a flexible temporality. Nevertheless, the concert does seem to have marked the end of FCOI’s visit to Kerry. By 5 September, Dublin’s Evening Herald was reporting the company’s return to Dublin (“Back from Kerry”). 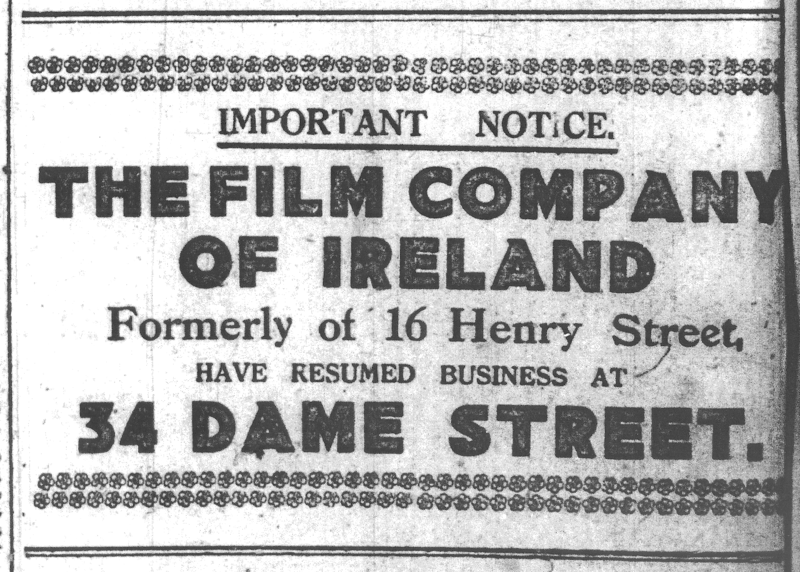 This suggests that the production unit had left Dublin before the publication of 14 August ad mentioning the eight films that were not subsequently made, as well as the Miser’s Gift trade show. Poor communication might explain why on 14 August, the company’s publicist did not have the titles for the scenarios that had begun shooting that week nor the locations at which they were being shot. But if this is true, then the production unit, which included Sullivan and possibly Fitzgibbon – it certainly included his wife – must have been surprized by the announcement of those eight titles in the national press. The tight timeframe also suggests that at least some and possible all of the scenarios were not carefully prepared and honed in advance but were hastily written on location. Only for The Eleventh Hour was a writer subsequently identified: Mark Coakley (“New Irish Film”). Whatever FCOI’s reason for the eventual choice of Kerry above other parts of the country, accounts in the Kerry papers of FCOI’s filmmaking are very reminiscent of Sidney Olcott and Gene Gauntier’s filmmaking adventures in Ireland between 1910 and 1914. Making films for the Kalem Company and later for themselves, Olcott and Gauntier had repeatedly gravitated back to the Killarney area, often basing themselves in the village of Beaufort and taking advantage of the rugged mountain, lake and seashore landscapes available in west Kerry. Their dramas of rural life, emigration and historical rebellion had been very popular with Irish audiences, making this region the most identifiable early Irish cinematic landscape. The Post, however, chose to compare Olcott and Gauntier’s films unfavourably to the as-yet-unseen filmmaking efforts of FCOI. “We are glad that at length an Irish Company has appeared,” a columnist commented. “The misrepresentation of Ireland and her people were the aims of most of those who took up work such as this in the past. The production created a feeling of resentment and indignation” (“Notes on News”). 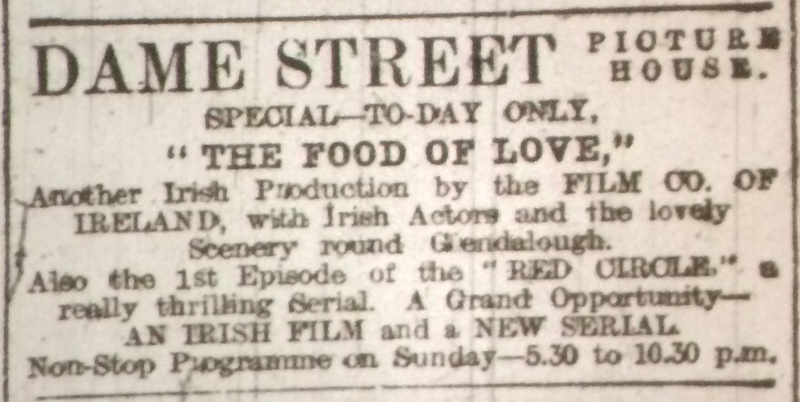 The last day of The Food of Love‘s run at the Dame Street Picture House; Dublin Evening Mail 4 Nov. 1916: 2. Nevertheless, this does not look like FCOI offering radically new representations of Ireland. With at least some of their first five films shot in Wicklow – this certainly seems to have been the case with O’Neil of the Glen and The Food of Love whose publicity made much of “the lovely scenery around Glendalough” – and the final four shot in Kerry, FCOI was once again exploiting Ireland’s most reproduced picturesque locations (“Irish Film Production”). Kerry location at which FCOI shot in August 1916. Derry Journal 10 Jan. 1917: 2. [p]retty widow Malone is counted by the political town councillor, the local schoolmaster and the village blacksmith. The two former are after her snug fortune, and are a couple of windbags, but the hearty smith, loyal when her fortune is supposed to be lost, wins Nora without much difficulty.” (“Condensed Film Critiques,” 14 Dec.). Dublin Evening Mail 24 Oct. 1916: 4. With this fit-out of post-production facilities underway, it took some time for the release of the remainder of the season’s films. The company’s first priority was the Irish market, and Boland appears to have been busy selling to cinemas all over the country. 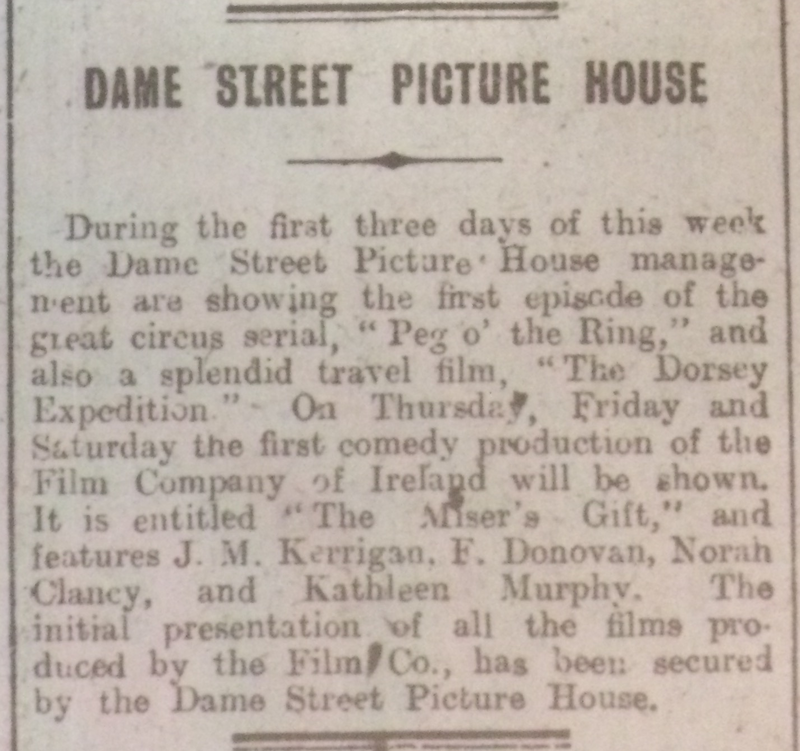 Despite the Dame Street Picture House claim in late October 1916 that it had secured “the initial presentation of all the films produced by the Film Co.,” the films premiered all over Ireland. Even FCOI’s long-heralded second release, The Miser’s Gift, had its first public viewings at Cork’s Coliseum on 12-14 October and a three-day run at Tralee’s Picturedrome (19-21 Oct.) before it had its Dublin debut at the Dame on 26-28 October. The Food of Love similarly premiered at the Coliseum on 23-25 October before appearing at the Dame for the three-day run of 2-4 November. However, Widow Malone was FCOI’s third release when it appeared at Kilkenny’s Cinema on Sunday, 22 October 1916 for a special benefit screening for the Gaelic League. The film had a more conventional three-day run at Belfast’s Kinema House later that week, beginning on 26 October. Indeed, Belfast, with the largest cinema-going population in the country, could not be and was not ignored in the awarding of premieres. Audiences at the Kinema House were the first to be offered Puck Fair Romance from 9-11 November. The Dame does seem to have debuted An Unfair Love Affair on 23-25 November. A Girl of Glenbeigh, however, premiered in Kerry, at Tralee’s Picturedrome on 27-28 November. The Dame also had the first viewings of the final two releases of the year. It opened The Eleventh Hour – FCOI’s second three-reel film –on 30 November 1916 for a three-day, end-of-week run. It was nearly a month later when the final release of the season, Woman’s Wit, had its debut at the Dame on 26 December. Much more remains to be discovered about this initial period of FCOI and the films they made in 1916, not least their November 1916 distribution deal with Davison’s Film Sales Agency and the patterns of exhibition in Britain. Let this attempt to bring together some of the newspaper and trade journal sources mark a start of that more complete account. “All-Irish Films.” Bioscope 28 Sep. 1916: 1285. 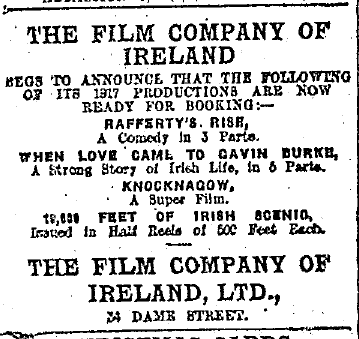 “Back from Kerry: New Films Produced by Irish Company.” Evening Herald 5 Sep. 1916: 2. “Bioscope Parliament.” Bioscope 2 Mar. 1916: 967-68. “Condensed Film Critiques.” Bioscope 14 Dec. 1916: i; 21 Dec. 1916: iii; 28 Dec. 1916: i. “Film Company of Ireland: Church Debt Wiped Out.” Kerry News 6 Sep. 1916: 4. Gifford, Denis. The British Film Catalogue, vol. 1, Fiction Film, 1895-1994. 3rd ed. London and Chicago: Fitzroy Dearborn, 2001. “Gossip of the Day.” Evening Telegraph 20 Apr. 1917: 2. Holloway, Joseph. Holloway Diaries. National Library of Ireland. “Irish Film Production.” Irish Times 30 Jun. 1916: 6. 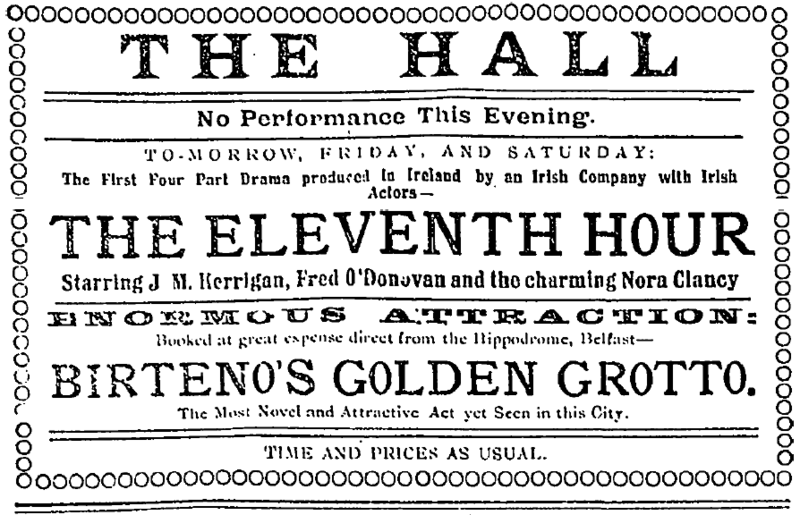 New Irish Film.” Evening Herald 1 Dec. 1916: 3. “New Irish Industry: The Film Co. of Ireland: A Promising Enterprise.” Freeman’s Journal 30 Jun. 1916: 6. “Notes on News.” Kerry News 1 Sep. 1916: 2. Paddy. “Pictures in Ireland.” Bioscope 18 Nov. 1915: 841; 17 Feb. 1916: 717; 24 Feb. 1916: 812; 13 Jul. 1916: 173; 27 Jul. 1916: 359; 28 Sep. 1916: 1285; 11 Jan. 1917: 194. Rockett, Kevin. The Irish Filmography: Fiction Films, 1896-1996. Dublin: Red Mountain, 1996. “What’s on in Dublin Next Week.” Evening Herald 23 Sep. 1916: 2. “With the Film Co. of Ireland: A Day with the Producers.” Irish Limelight Jun. 1917: 10-11.